We all have our favorite beauty and personal care products, and I’m no exception. But I’ve spent the last few years slowly trying to replace most of my conventional products with safer alternatives, and that’s meant having to say goodbye to some of my favorites. The problem was, there were some products I was so attached to, it took me a while to find the right “non-toxic” replacements. After all, it’s one thing to find products that are made with all the right (i.e. safe) ingredients, but it’s another thing to find clean products that actually perform like our conventional favorites! That’s why, after a lot of experimenting, I’m thrilled to share some of my favorite natural beauty swaps today. 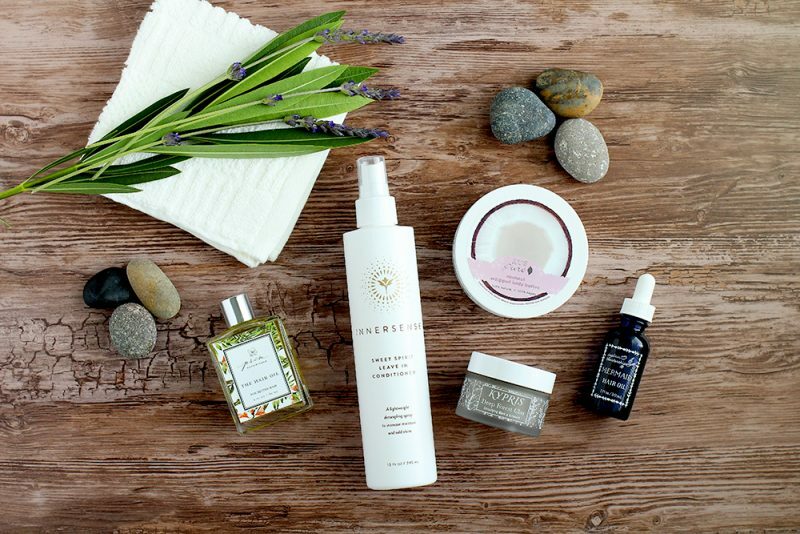 Although it’s taken me a while to find the right replacement products, these natural beauty swaps certainly fit the bill. Not only are they made with cleaner, safer ingredients than their conventional counterparts, but they also perform just as well. I loved my GLAMGLOW exfoliant mask, and it took me forever to find a replacement. After experimenting with many other masks, I eventually stumbled across KYPRIS Beauty Deep Forest Clay. The stars had finally aligned! This mask alternative not only detoxifies, but it exfoliates and leaves my skin smooth as could be. Just remember that, like its conventional counterpart, it’s pretty strong. So those with sensitive skin should leave it on for shorter amounts of time, until you figure out what amount of application time works best for you. For me, KYPRIS Beauty Deep Forest Clay works just as well as GLAMGLOW, and without ingredients such as synthetic fragrance and benzyl benzoate. I use it about once a week, so it lasts me a while. You can also find KYPRIS Beauty Deep Forest Clay here. This was another product that took me a long time to replace because I really loved the conventional version. Not only did Moroccanoil Treatment work well, but the biggest benefit to using it was the fact that I could use it generously, and it never left my hair greasy. Unfortunately with natural hair oils, it’s all too easy to end up with greasy looking hair. So I held on to my Moroccanoil for as long as I could. That is, until the eczema on my hands spun out of control, and I had to replace EVERY product that came into contact with my hands. Fortunately, I eventually found three natural beauty swaps that work well, and none of these aggravate my eczema (yay!). They are all made of organic oils and free of synthetic fragrance and artificial colors (yay again!). Prim Botanicals The Hair Oil: this rockstar blend of mostly organic oils leaves my hair soft and smooth, and it smells absolutely lovely! Captain Blankenship Mermaid Hair Oil: another blend of organic oils which leaves my hair smooth and silky. Kate Blanc’s Moroccan Argan Oil: if you’re not wanting to spend a lot on a hair oil, this is a great cost effective, clean alternative. There are many pure argan oil brands out there, but this organic version is the one I use. Years ago, as esthetician told me that I really needed to use an enzyme mask to prep my skin and make exfoliation more effective. And boy, was she right: it was the piece of the puzzle I was missing in my beauty routine. So at the advice of a Sephora rep, I began using Ole Henriksen’s Blue/Black Berry Enzyme Mask. It worked perfectly, but I eventually knew I didn’t want a product that contained parabens and synthetic fragrance. Enter MaryRuth Organics Vitamin Enzyme Mask, which uses natural (and many organic) ingredients to accomplish the same thing, prepping my skin for exfoliation. I really loved my thermal heat protectant spray from TRESemmé. It worked well and was an easily accessible, affordable drugstore brand. But I knew I had to find an alternative due to its long list of questionable ingredients. I tried many heat protectant products that did not work (leaving my hair dry or frizzy) before finally discovering Innersense Sweet Spirit Leave In Conditioner. I love this formula of mostly organic ingredients, and it really works, leaving my hair soft and silky (and never greasy)! I spray it on my damp hair before blow drying and styling. You can also find Innersense Sweet Spirit Leave in Conditioner here. Guys, I used to be addicted to this lotion from Bath & Body Works. Anyone who knows me knows that I love any type of sugary, cookie-inspired, vanilla-y scents (yes, I’ve made “vanilla-y” a word). And Warm Vanilla Sugar was my favorite. Actually, I loved most of the scents from Bath & Body Works, because, let’s face it — they pretty much all smell delicious. But what I don’t like are the ingredients used in Bath & Body Works products, such as synthetic fragrance, parabens, petrolatum, and artificial colors. Fortunately, I discovered the body creams at 100% Pure. These body creams are naturally-scented and filled with nourishing ingredients, and they smell just as delicious! They have been my go-to for the last couple of years for yummy-smelling body lotion. In particular, 100% Pure Vanilla Bean Nourishing Body Cream is the perfect replacement for my prior vanilla lotion favorite. By the way, if you don’t care for vanilla, 100% Pure offers several other yummy-smelling scents. You can also find 100% Pure Vanilla Bean Nourishing Body Cream here. Much like my mention of Bath & Body Works body lotion, I used to love the sweet scent of this body butter from Jaqua. Combined with a luxurious feel, applying this body butter always felt like a special indulgence. Unfortunately, Jaqua Buttercream Frosting Body Butter contains some undesirable ingredients, including artificial fragrance and synthetic preservatives. So I was thrilled to find a cleaner version in 100% Pure’s Coconut Whipped Body Butter. It also smells sweet and delicious, and provides luxurious, silky moisture. It’s filled with nourishing, natural (and some organic) ingredients. And once again, 100% Pure offers other scents, if coconut is not your thing. You can also find 100% Pure Coconut Whipped Body Butter here. 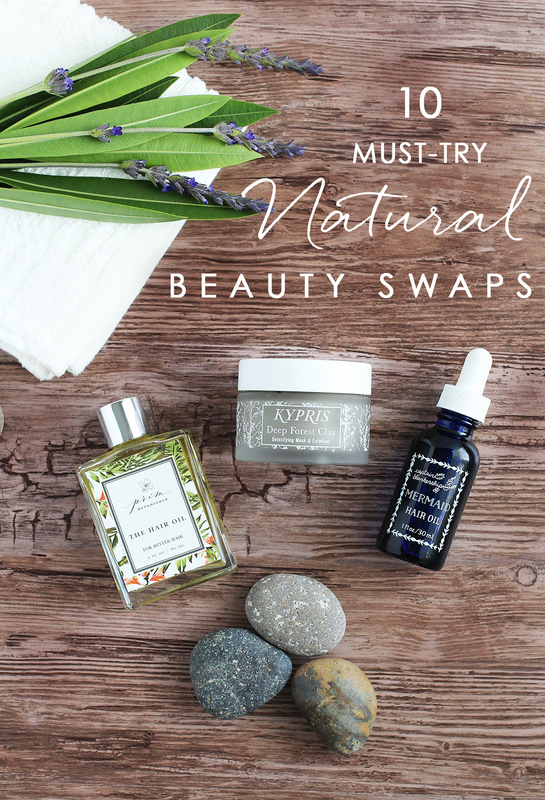 I have to admit, I haven’t yet had the chance to personally try out these last two natural beauty swaps. But I used to use Crest White Strips, and I’ve heard great things about this clean alternative. In particular, these clinically-tested Whitening Strips from Oral Essentials whiten teeth without the use of hydrogen peroxide or baking soda, two ingredients which can cause sensitivity or wear down tooth enamel over time. This is great news for those of us with sensitive teeth, or those of us who are concerned about preserving the health of our tooth enamel. I can’t wait to try out these clean and gentle (yet effective) whitening strips. Just like the whitening strips, I admittedly haven’t yet tried out this LED teeth whitening kit. Both the Crest version and the Primal Life Organics version use LED blue light technology to enhance the whitening process. But Primal Life Organics omits those harsh ingredients (like hydrogen peroxide) and instead, uses organic extra virgin olive oil, essential oils, several clays, and charcoal to do the whitening. Once again, it’s the perfect scenario for those with sensitive teeth who want to avoid the harshness of peroxide, while using only clean, natural ingredients. The Primal Life Organics LED Natural Teeth Whitening System is definitely on my “must-try” list! You can also find Primal Life Organics’ LED Natural Teeth Whitening System here on Amazon. So now it’s your turn. What are some of your favorite natural beauty swaps? Please comment and share! *All ingredients listed are accurate as of the time of this posting on 5/5/18. In the future, be sure to please check with the individual brands for any potential ingredient changes.